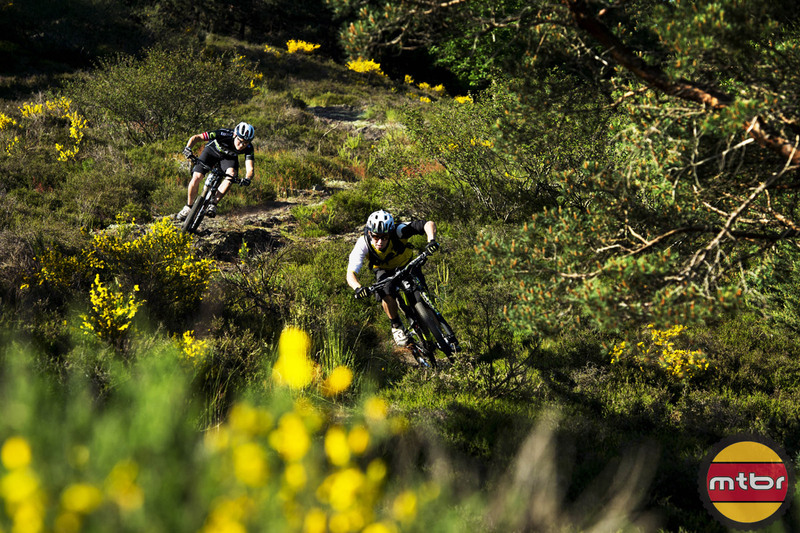 Enduro World Champion Jerome Clementz and fellow Cannondale Team rider Ben Cruz give the new 2014 Cannondale Trigger 29 Carbon a good workout in some of Jerome’s local trails in eastern France (Alsace to be exact). Watch the video and check out the killer photos. 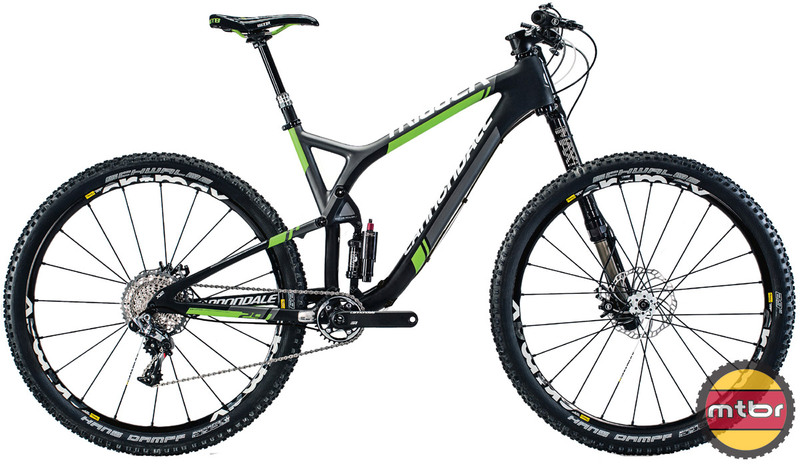 It is interesting to see Cannondale sticking to their 29er guns, given all the hype about 27.5. With their DYAD shock providing adjustable travel from 80mm to 130mm on the Trigger, it seems that the Jekyll with 150mm would be the model most likely to become a 27.5. Will it? Only time will tell. I had a chance to do a run down the trails at Deer Valley Resort on the Trigger 29 and found it to be very agile handling for a 29er (likely from the 60mm of offset featured on the fork). Overall, the Trigger 29 felt like a bike with way more than 130mm of travel (which is a common trait for full suspension 29ers) and soaked up hits better than other bikes of similar travel. 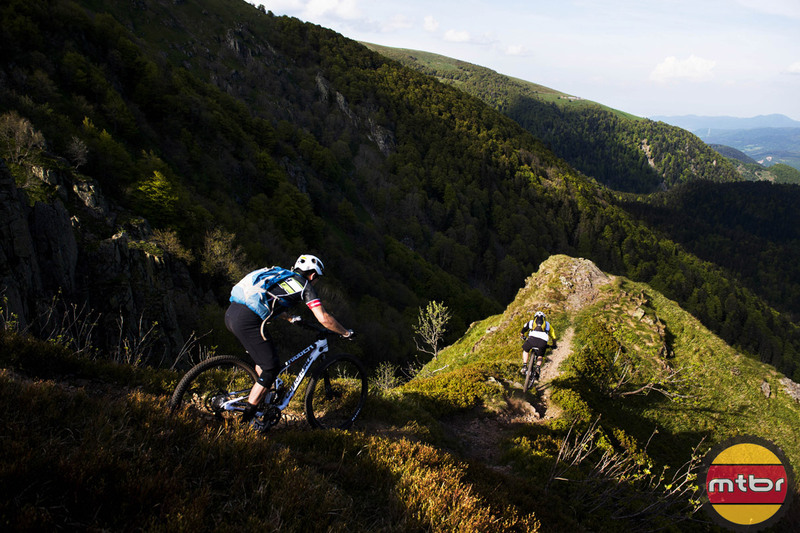 There are certain instances where a 29er will not transition from side-to-side as lightly and quickly as a 26er or 27.5, but this goes for all 29ers. I did not get to test the climbing ability of the Trigger 29 beyond a couple of short punches, but on those quick efforts it was an efficient, comfortable climber. 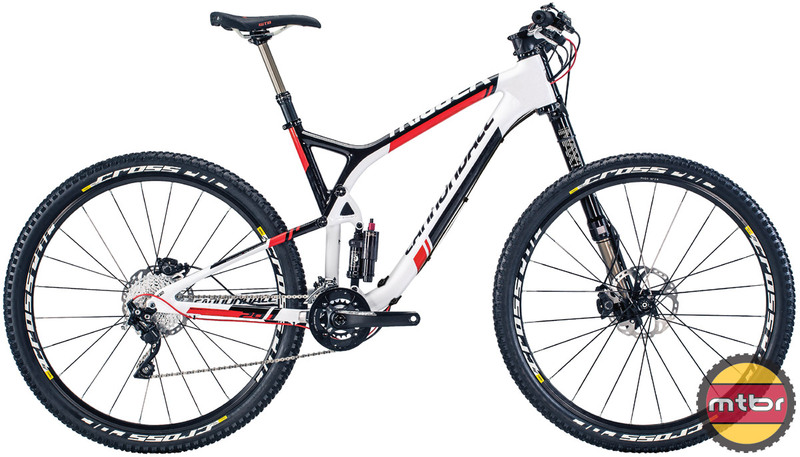 The real stand out spec of the Trigger 29 for me was the Lefty Carbon Supermax fork. I’ve spent time previously on the 26er Lefty Carbon Max fork and just like that iteration, the Supermax is one of my favorite forks hands down. The tracking ability of this fork is simply amazing and instills confidence. 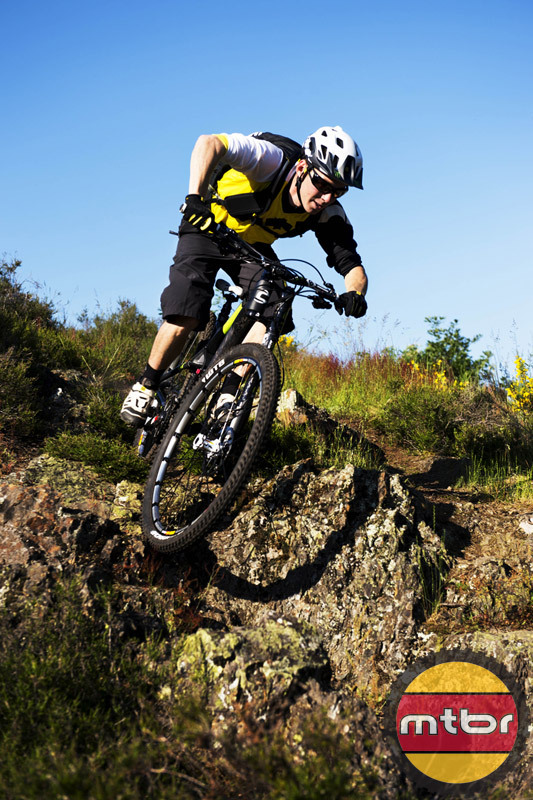 It is one of those products that is so good, it can make you a better rider. If you ever wonder why so many builders of hand-made bikes spec Lefties, this is why. 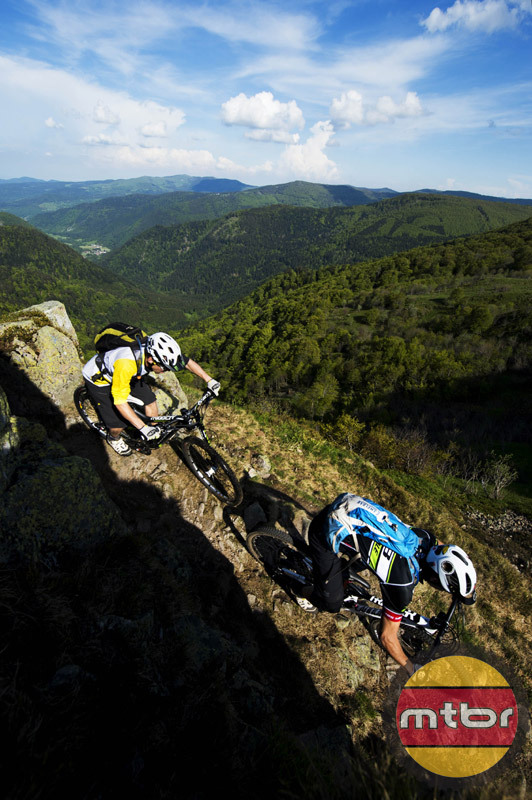 TRAVEL: DYAD RT2 rear shock provides 80mm to 130mm on-the-fly adjustable rear travel. Two-shocks-in-one DYAD technology with shock stroke, air spring volumes and damping created specifically for the Trigger 29. ATTITUDE ADJUST: Switch between modes on the DYAD and the bike’s geometry changes too. 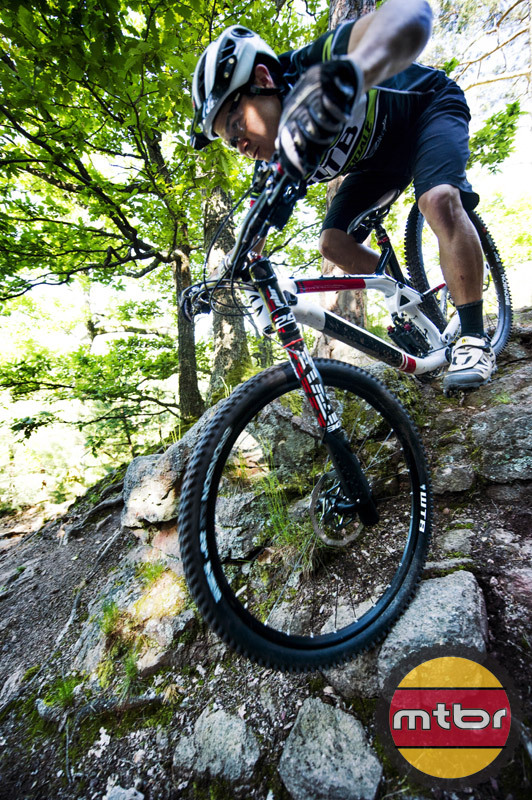 Steeper and more nimble in Elevate mode, lower and more stable in Flow mode. BALLISTEC CARBON / SMARTFORMED ALLOY: Using fibers developed by the military for ballistic armoring, this high-strength carbon construction process yields a frame that’s lighter than aluminum and pound-for-pound stronger than steel. The alloy versions use our ultra sophisticated SmartFormed aluminum construction for a frame that’s strong yet light. ECS-TC SYSTEM: Clamped, 15mm thru-axles in the shock linkage and swingarm pivot, as well as double bearings in the seat stay pivots eliminate flex and provide unmatched center-stiffness for complete control. LEFTY SUPERMAX FORK: The most torsionally rigid suspension fork ever made, the SuperMax brings unheard-of levels of steering precision to longer travel 29’ers. The unique 60mm offset helps increase both high speed stability and low speed agility – perfect for Trigger 29’s full-throttle attitude.